At Holsinger&apos;s Meat Market we take pride in our expert meat cutting and we provide this service by ordering in Front Quarters, Hind Quarters, Half and Whole Beef to custom process for your families needs. We will cut, wrap and freeze your beef the way you want it. At Holsinger&apos;s we order only the best in Grain-Fed Local Beef. Cut and wrapped fresh every time. We are not happy, unless you are happy. Although we are not a slaughterhouse facility, we will make arrangements to have your beef or pork livestock slaughtered and delivered to our facility. We will process your animal into the finest cuts and products and package them for your freezer just the same. To ensure timeliness with this service please call ahead to make arrangements with our staff, before making slaughtering arrangements. When butchering season comes around come visit us at Holsinger&apos;s we will custom cut and cure you pork products year round. Turn your fresh hams into a Hickory Smoked, Sugar Cured, Holsinger&apos;s City Hams, you will be glad you did. Let us Custom Cure and Smoke your Bacons, Shoulders, Loins, and Hocks. As well as our Famous Cured and Smoked products we will custom cut your fresh meats, and make fresh sausages, that your family will be proud to eat. If you do not have the pork, no worries. We will supply the pork necessary to make these delicious products for you. We will do whatever is necessary to put delicious products on your table and in your freezer. For a Grand Occasion, there is nothing like celebration with a roasting pig. We will order a fresh roasting pig to suite your gathering leaving you the choice to cook and smoke yourselves, or we will provide that service for you. Our smokehouse gets rather busy at times so please call ahead and give plenty of notice for this service. We process Wild Game meat year round into a wide selection of delicious fresh and smoked products for your family and friends to enjoy. 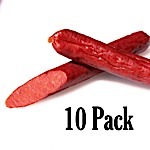 Including Hot Dogs, Fresh and Smoked Sausages, Bolognas, Snack Sticks, Jerky and Cured Hams. We will cut and wrap your fresh meat cuts, for your families needs in a premium freezer paper to lock in freshness and lock out freezer burn. Vacuum sealing is available for additional cost. Do you have a freezer full of wild game meat but want to spice up your inventory? Bring in your game meat and we will process your meat regardless of the season, provided you have the permits required by your hunting regulations authority.